Allah’s Divine acts are not interpreted according to motives; they are too exalted for being chaotic; it is illogical to assume that they are void of wisdom. If some of the wise meanings of these acts is hidden from the smartest of mankind, this does not mean that it does not exist. The power of the human mind is limited; the utmost of its perfection is the attainment of some of the extrinsic features of some creatures that fall under the perception of the human senses and mentality, or the realization of some of the basic principles that govern them as laws of gravity,electricity and light. For instance, the light has many laws, yet noone can ever claim that he perfectly comprehends the essence of light;sometimes they call it particles and sometimes waves; that led scientistsrecently to describe light as having a dual character as it combined bothdefinitions. Allah’s Mercy is manifest. He had not ordained that man would be in need to reveal the essence of all the created things; Hehad ordained man to need to grasp their characteristics, the phenomena,and their effects; such as the heat and the warmth of the sun, the lightof the moon, the characteristics of gravity, electricity, floatation,..etc. For instance, what science has revealed with respect to molecules of water as composed of two atoms of oxygen and one atom of hydrogen nears the discovery of the essence of water, but it is impossible to know the secrets of the hydrogen atom. This is inaccessible to mankind, Allahbestows knowledge in direct proportion to the degree of the need of human being for this knowledge; the human mentality should never transgressthe limit Allah had ordained for its imperfect knowledge and power.Thereupon, we should look at all the created things and try to attain knowledgeof the Great Creator and His perfect Attributes. Moreover, the human mindis not supposed to delve through the Attributes of Allah to knowhow they are attributed to Him. It is essential to know that Allah, Praise and Glory be to Him, is not compelled to do His Divine Acts; they are the fulfillment of His Will and His all-inclusive Knowledge. He is never compelled to do anything. These attributes can never be separated from the Exalted Self; His Will or Might are not related to them, but they are eternally linked to Him. Examples of these attributes are the Eternal Life, the all-inclusive Knowledge, the Power, the Will, the All-Hearing and the All-Seeing Powers, Supremacy, Pride, Glory, and Honour. These attributes are linked to His Will and Power in every time and place. The singular aspect of these attributes is still occurring till now according to His Will; these attributes are ancient. Allah, Praise and Glory be to Him, accomplishes all what He plans or creates governing all things; His Acts occur one after another according to His Wisdom and Will; Glory be to Him; He is Allah. Allah says, “The most beautiful names belong toGod; so call on Him by them; but shun such men as use profanity in Hisnames” (A‘RAF, 180). Glory be to Allah, He is as He describes Himself in His Qur’an and as prophet Muhammad, Allah’s Prayers and Peace be upon him, described Him in his Hadith. Using profanity in the names of Allah is the deviation from their authenticity and their conception. The deviation from them may be the upshot of misstatement, negation, modality or analogy, as noone knowsAllah except Allah. Misstatement means: to state wrongly and falsely. Thereupon, any interpretation of the Most Beautiful Names that includes new meanings that are not linked to the literal meanings that had been mentioned in the Qur’an or the Hadith is but misstatement. Negating the attributes of Allah means: denying theirrelation to the Exalted Self, or claiming that their literal meaningsare not intended in themselves without giving an alternative for them. Modality: is the belief that Allah’s Attributes have a certain mode and that we can use the adverb (how) on asking about them; no one can ever know the mode of these attributes save Allah, Praise and Glory be to Him. Analogy: is the concept that Allah’s Attributes are comparable to those of His creatures. Allah says, “..there is nothing whatever like unto Him, and He is the One that hears and sees all things” (SHURA, 11). This Quranic verse is fundamental in perceiving the attributes; it comprises both affirmation and negation. This verse negates any attempt at analogizing on comprehending and grasping these Divine Attributes. Moreover, it affirms the All-Hearing and the All-Seeing Powers of Allah, so we should not negate nor affirm these attributes absolutely, but wehave to affirm and believe in them without giving examples or using analogy. Aiming at proving Allah’s Existence is mandatory; yetthe essence of the Exalted Self is prohibited to think of. Attemptingto reveal the modality or the quality of the attributes of the ExaltedSelf is forbidden, and we should not study the methodology of the attributes’linkage with the Exalted Self. Some of our ancestors said about the attributes: “They pass as they were mentioned in the Qur’an and the Sunna without any interpretation”. Some later Scholars said that there should be no attempt at studying the true meaning, the modality or the essence, and that the discussion must be restricted to the literal meaning of the words and attributes. 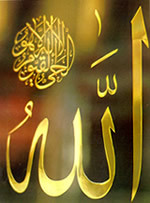 Imam Ahmad Ibn Hanbal said, “We should not attribute to Allah save what Heattributed to himself or what His Prophet, Allah’s Prayers and Peace be upon him, attributed to Him, without transgressing theQur’an and the Hadith” Nu‘aym Ibn Hammad said, “Anyone who analogizes Allah to His creatures is an atheist, and anyone who denies what Allahattributed to Himself is an atheist”.